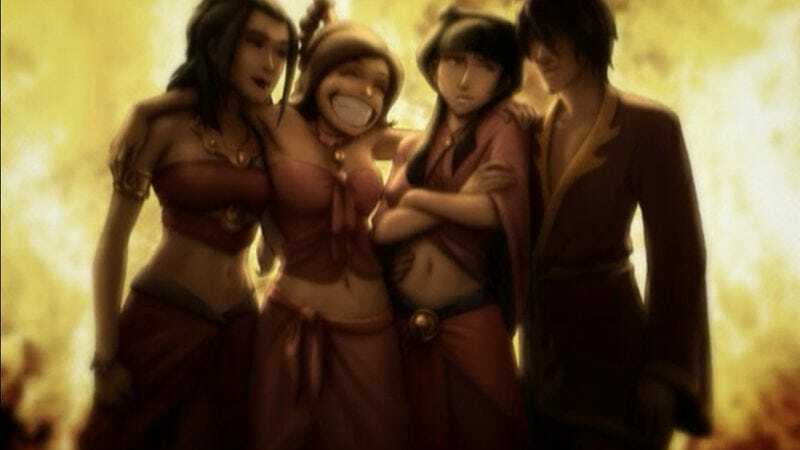 An Avatar: The Last Airbender episode like none other, “The Beach” is a rare opportunity for Zuko, Azula, Ty Lee, and Mai to attempt to be regular teenagers—with predictably disastrous results. When the alpha female of the group is a young Pol Pot in training, the group dynamic does not lend itself to John Hughes-style wackiness. These four characters have had epic adventures that belie their ages, and the concerns of normal kids are completely outside of their experiences. However, they do manage to have a moment of cathartic sharing that deepens our understanding of each character and their understanding of each other. Azula turns out to be the funniest fish-out-of-water, as her world-spanning nightmarish vision of power is on a scale wholly inappropriate for normal teenager interactions. She can’t even play a volleyball game without burning down the net and gloating like Doctor Doom over her victory. Her attempt at impressing a boy includes blue flame bursting from her hands as she rants about dominating the Earth together. Hot! At the same time, though, she has the most surprising moment of vulnerability when she confesses to being hurt that mother thought Azula is a monster, even as she acknowledges that her mother was right. Despite her frequent appearances on the show, Azula has not been rounded out very well. Like Ozai, she appears to be driven by power and megalomania, and she seems enough of a sociopath to be unconcerned about the consequences of her actions. It’s startling to realize that she knows that she is a sociopath, but, of course, she is coldly rational and highly intelligent enough to recognize her own behavior. There is a little moment in Zuko’s memories when he sees himself as a child on the beach in happier times, with his father playing with a widely grinning Azula, the madness of both still years in the future. It’s heartbreaking in contrast to the Azula and Ozai of the present. In fact, Zuko’s memories of his happy childhood are heartbreaking all around. He remembers Ozai as a caring and protective father, not an evil man who would betray his own wife and scar and banish his eldest son. When he reveals his confusion to the others, it is both sad and typical of Zuko that he is too wrapped up in his emotions to realize that he, more than any of the others, should never reveal any vulnerability before Azula, who is so adept at spotting weakness that she figures out how to beat the other volleyball team in seconds based on the way their server is standing. Zuko’s need to belong is touching, though. While Azula made friends in her childhood, Zuko apparently did not. The climactic confessional scene at the fire seems a bit forced, as it is unlikely that these kids would ever feel free to speak honestly to each other, even when gathered on a beach around a campfire in a primordial bonding experience. However, on the other hand, if this experience is unable to get these kids to open up, nothing else will. It’s vital to the narrative that Zuko confront his emotions and nagging conscience, and it’s valuable to the narrative that Azula, and, to a lesser extent, Ty Lee and Mai, are given some backstory and inner life. After the personal backstory of “The Beach,” the Avatar team was wise to schedule an episode that delves into the background of the series’ greater arc. On rewatch, it’s hard to tell how much of this was mapped out before the earlier seasons were made, but it seems an essential part of the mythology that Sozin and Roku were lifelong friends before becoming bitter enemies, an important current of subtext running throughout Aang and Zuko’s every encounter. This story redefines the Fire Nation’s genocidal war into the legacy of a power struggle between two individuals, which is somehow truer than the assumption that the Fire Nation is simply a nation of power-hungry assholes. The history behind Sozin’s war and the genocide of Aang’s people is told in little glimpses of Sozin and Roku’s lives. Because most of these reflections are shown through Aang’s spirit-world journey with Roku, these events unfold from his perspective alone, although Zuko is surely reading them from Sozin’s perspective. Roku’s life shows how the Avatar is supposed to proceed under normal circumstances: learning of his or her identity only when an older teen, training with master benders throughout the world, and imposing peace as an adult, even if through force. There is a certain stasis in the Avatar’s responsibilities, which is perhaps why in the long chain of Avatar lives prior to Aang, none has apparently ever had to deal with the genocide of one of the four nations before. Considering that every Avatar’s lifetime ends with some 16 years where the new Avatar must grow before learning of his or her identity, it is surprising that there have not been more political shenanigans during these times when the world has been virtually Avatar-less. With the Legend Of Korra trailers showing the world of only 100 years hence having large and technologically-advanced cities, the catalyst for this growth could be the broken Avatar chain from the unbalanceable state of having one of the nations permanently removed from the world. Roku really did mess up. Food for thought, at least. The best Roku and Sozin interaction comes when they are both grumpy middle-aged men. Sozin, voiced at this stage in his life by the ever-awesome Ron Perlman, has defied Roku’s advice and begun taking over the Earth Nation by force. Roku, uncharacteristically, threatens violence with his first words, and when he battles Sozin, he leaves the Fire Lord, a proud and angry man, stranded on a pole in the ruins of his palace. Did he think that it would end there? The Roku of this time was much different than the kindly Roku of Aang’s visions, and perhaps death has mellowed the man considerably. Even the older Roku feels it necessary to battle an erupting volcano after his wife and the villagers have fled. When Aang fought the volcano back in “The Fortuneteller,” he was trying to save lives. Roku, though, is fighting the volcano for less obvious reasons. He wants to save his home, yes, but he appears to be ignoring the signs that he is outmatched. Even though Sozin left him to die, if Sozin had never come to his aid, Roku still would have died. His dragon’s loyalty and bond in wrapping itself around Roku at the moment when the lava overran him is a powerful little touch. Even more powerful is the reveal that Zuko and Azula’s mother was Roku’s granddaughter. She would not have known Roku. He has been dead for 100 years, and she, along with Ozai, now that I think of it, would be around 40. (So wait, one of her parents was older than 60 when she was born? I should know better than trying to work out Avatar generations.) It should be more of a problem that Iroh has Roku’s topknot-crown thing hidden in his cell, because for one thing, the last time we saw it, the crown was sitting on the floor of Roku’s house while molten lava was flowing over it, and for another, where does he hide it in his cell? And how did he get it? However the storytelling is so powerful that it is easy to hand-wave our way past this little glitch. In the B-plot of “The Beach,” the Aang Gang finally meets Combustion Man, the Anton Chigurh of the Fire Nation. Well, that’s not really a fair comparison, as Chigurh was an interesting villain in his own right, while Combustion Man is a physically imposing yet ultimately boring menace. The details are as sharp as ever, though, with the implied backstory in the man’s metal right arm and leg, and the trained vulture-eagle creature he uses. Also good is how he draws his breath in before sending a blast towards the Gang, and that his blasts appear to originate from his forehead, the location, as Guru Pathik pointed out, of the light chakra. Combustion Man’s cat-and-mouse battle with Aang is mostly interesting for its use of terrain and Aang’s slow-motion move where he airbends away from an explosion and earthbends his way through a stone column while in the air. In the swimming scene early in “The Beach,” how does Toph know that Aang’s tattoos are visible? Shouldn’t that be a Katara line? The little details make the character. When the two bored Fire Nation soldiers spot the Avatar, the larger one, who has only a single line, is running the hilt of his sword between his toes and then sniffing it. Li and Lo’s dinky little beach house is amusing, and their good cheer in the face of their ungrateful and spoiled charges is sweet. Zuko: “That food was for my cranky girlfriend!” Ha! Aang takes the lesson that everyone, even the Fire Lord, deserves a chance, which is in keeping with Aang’s personal philosophy. An angrier Avatar would have fallen more in line with Sokka’s thought that the Fire Nation royalty are and have always been jerks. Another thought that has been bugging me for some time: If Aang and Roku et al. are Avatars, what are they avatars for? 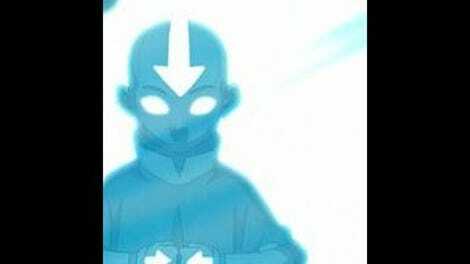 An avatar is an incarnation of a higher power, but the show has been clear that there is no higher power guiding them, only a chain of reincarnation that they can access. A higher power would mostly likely not have taken out Roku when Sozin was looking to murder an entire people, for instance. In some sense, Aang is Zuko and Azula’s great-grandfather. That will make for an awkward family reunion.